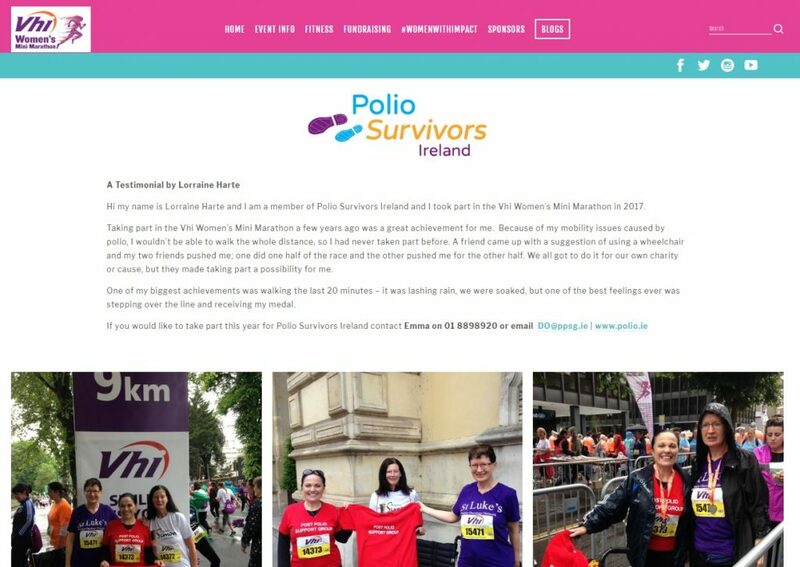 “Hi my name is Lorraine Harte and I am a member of Polio Survivors Ireland and I took part in the VHI Women’s Mini Marathon in 2017. Taking part in the Women’s Mini Marathon a few years ago was a great achievement for me. Because of my mobility issues caused by polio, I wouldn’t be able to walk the whole distance, so I had never taken part before. A friend came up with a suggestion of using a wheelchair and my two friends pushed me; one did one half of the race and the other pushed me for the other half. We all got to do it for our own charity or cause, but they made taking part a possibility for me. If you wish to take part you can register online here! If you or any of your family or friends would like to raise funds on our behalf, please contact Emma by emailing DO@ppsg.ie for a t-shirt & sponsorship card or call the office on 01 889 89 20.